Caroline’s school bake sale is tomorrow and I needed something super easy, festive and delicious to throw together after dinner last night. 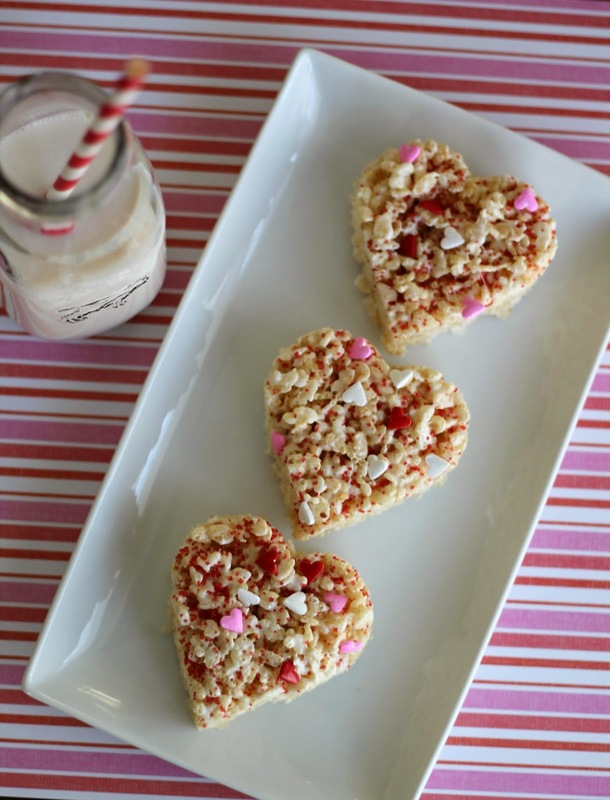 Snap, crackle and pop – enter Valentine Rice Krispie Treats! In less than an hour I had whipped these yummy treats up, cut them out in hearts, bagged and priced them for the bake sale. 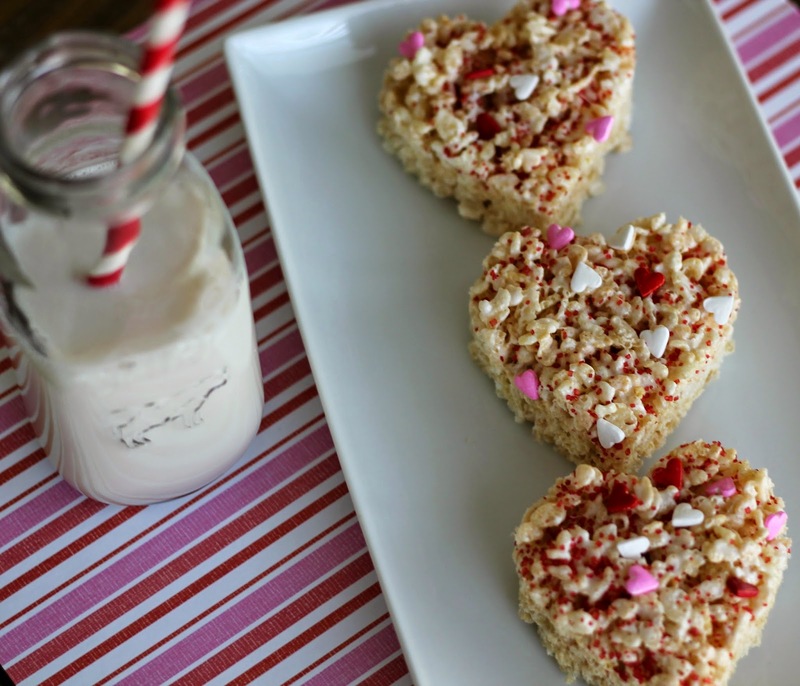 I followed the original recipe for Rice Krispie Treats, topped them with Valentine sprinkles and cut them out with a heart cookie cutter. 1. In a large saucepan melt butter over low heat. Add marshmallows and stir until completely melted. Remove from heat. 2. Add Rice Krispies cereal. Stir until well coated. 3. Using buttered spatula or wax paper evenly press mixture into 13 x 9 x 2-inch pan coated with cooking spray. Top with sprinkles. Cool. Cut with heart shaped cookie cutter. These treats look so yummy! 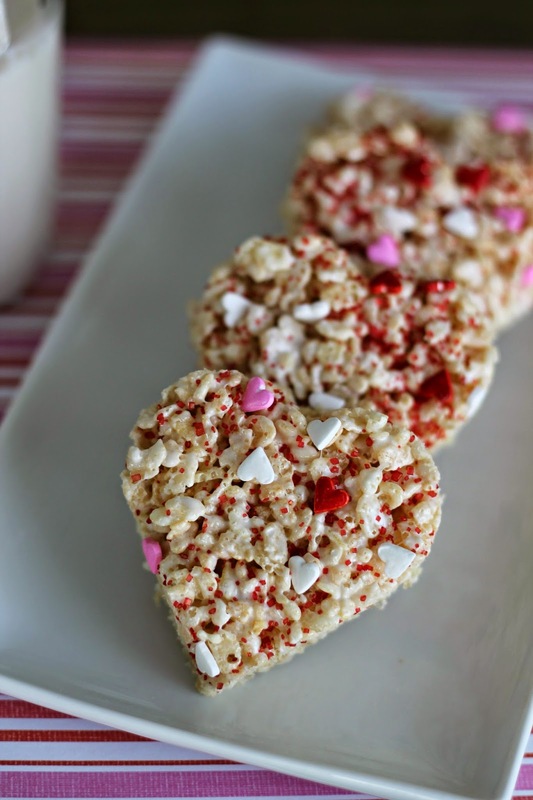 I don't care how old you get, Rice Krispie Treats are always a yummy treat =) I don't have any little ones, but I might make these for myself and my fiancé. Such a cute easy treat! Love them! They look so festive and yummy. These are so cute! I might make these for our work Valentines Day party. How many were you able to get out of this recipe? These are so adorable!! They would be so perfect to make a huge batch, wrap in a little pink plastic treat bag, and hand out to friends, family, and co-workers! Ive been meaning to purchase that book for years – thanks for pushing me to do so with your rec 🙂 Happy Valentine's Day!